Please note: if you subscribe to this free webbased calendar, the additional events are not included into your private Google calendar, but they are added in a new, additional calendar that can be update by us remotely! We have no access to or control over your private calendar, but we can still remotely update the 2018 World Cup calendar! You can also download our calendar data (it is public) and import it into your normal calendar. But the we cannot update the data any more! By doing that, you subscribe to our calendar and then you will be able to see the 2018 Fifa World Cup in your Google calendar account. Step 4: after a while (can take several hours!) 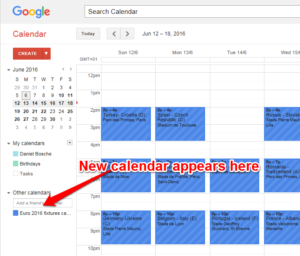 you can see the data of this additional calendar next to your private Google Calendar. The additional calendar will appear underneath “other calendars” on the left hand side. Step 5: You can chose your own color and notification settings using the dropdown menu that is visible when you hover over the new calendar. If you are using an Android device with Google Calendar, you can also see this additional ical-Calendar on your mobile phone. It will take some time to appear there in your normal Google calendar app. It helps to use a fast internet connection (wifi) as the data has to be syncronized. You might have to play around the the settings to make the new calendar data appear in your calendar app. ⚽ Fifa Football (soccer) World Cup 2018 in Russia. Group stage game in GroupA. ⚽ Fifa Football (soccer) World Cup 2018 in Russia. Group stage game in GroupB. ⚽ Fifa Football (soccer) World Cup 2018 in Russia. Group stage game in GroupC. ⚽ Fifa Football (soccer) World Cup 2018 in Russia. Group stage game in GroupD. ⚽ Fifa Football (soccer) World Cup 2018 in Russia. Group stage game in GroupE. ⚽ Fifa Football (soccer) World Cup 2018 in Russia. Group stage game in GroupF. ⚽ Fifa Football (soccer) World Cup 2018 in Russia. Group stage game in GroupG. ⚽ Fifa Football (soccer) World Cup 2018 in Russia. Group stage game in GroupH. ⚽ Round of 16, game 3: Spain-Russia 3:4 i.E. 3rd place match (match for "Golden Pineapple" between the 2 loosers of the 2 Semi-finals. Nice blog and Great information 🙂 Keep this work on.. Unfortunately, it seems that my first comment was not accepted !